Helping real people reach real resolutions. We are accomplished divorce mediators. Join Us for Our Six Year Anniversary Ribbon Cutting! Do-It-Yourself Divorce is Experienced and Caring. Murrieta and Temecula’s premier divorce document service provider. DIY Divorce Murrieta & Temecula is operated by registered and experienced paralegal Kristin Harrison, who has worked in Family Law since 2003. She earned her B.A. at the University of Michigan, and her Paralegal Certificate at the University of San Diego. If you need to open a new case, finish an existing case, or request a hearing when the divorce is filed we can provide cost-effective services. 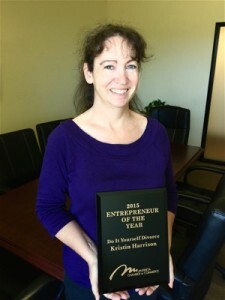 Kristin was awarded the “2015 Entrepreneur of the Year” by the Murrieta Chamber of Commerce. 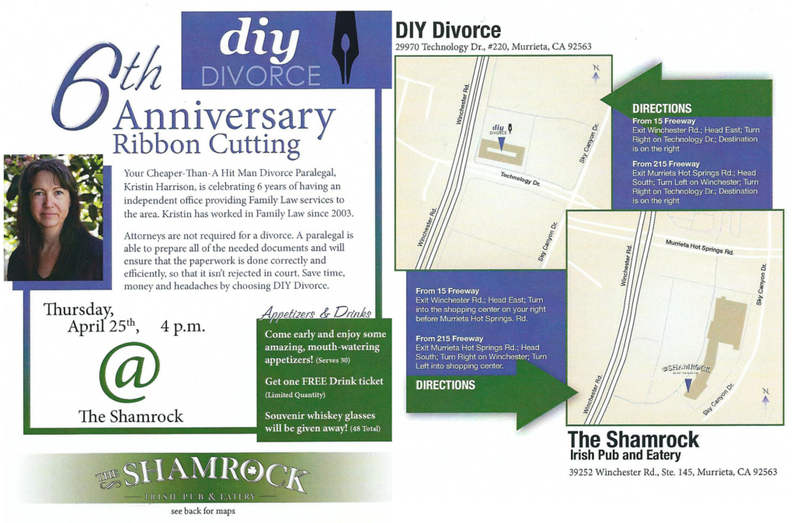 Do-It-Yourself Divorce is located at 29970 Technology Dr #220 Murrieta 92563. Please call Kristin Harrison at 951-795-3900 or contact her now. You are welcome to send an email, but phoning is the most efficient way to have your questions answered and get a quote regarding the cost of your specific case. A California divorce paralegal will save time and money. Attorneys are not required for a divorce, a paralegal is able to prepare all of the needed documents. A paralegal will ensure that the paperwork is done correctly and efficiently. Please call (951) 795-3900 to discuss your case and receive a quote. You are welcome to send an email, but phoning is the most efficient way to discuss your case and determine the cost. Do-It-Yourself Divorce is a paralegal service in which you are self-represented, no attorney is connected to the case. You save time when you have professional assistance, avoiding the paperwork being rejected by the court. Cases require three office visits, neither party has to go to court. We get the case filed, and perform service of the papers when the Respondent comes to our office. If the Respondent is out of state, the papers can be mailed if the Respondent will sign a Notice of Acknowledgment of Receipt. We don’t send you away with a questionnaire to return to us, or blank forms to fill out on your own. Our paralegal sits with you to fill out and sign all of the needed paperwork. Some people try to file their California divorce without the assistance of a professional, only to require the services of a paralegal when the confusing forms overwhelm and discourage. If a mistake is made in the original filing, it can be difficult to correct the mistake and finish the case. Save yourself the hassle of filing on your own, save yourself the fortune of hiring an attorney. Even when your ex refuses to cooperate. Do-It-Yourself Divorce with a Legal Document Assistant will get the paperwork done correctly the first time, saving you time. The stress of trying to understand the paperwork is also eliminated. When there is no cooperation from one party you can pursue a Pure Default, or file for divorce and request a Hearing. If you want child and/or spousal support ordered and believe the other party will not voluntarily pay, we can file for divorce and request a hearing at the same time. Hearings for support are not automatically set when a divorce is filed. The court collects a filing fee of $450 when a divorce is filed, if a hearing is requested an additional $90 must be paid to the court. These fees are separate from the fee DIY Divorce charges to handle all of the paperwork. Filing a new case is the cleanest, easiest path since we know there are no mistakes to fix! However, many of the cases we take involve finishing a case started by either attorneys or the parties. We will look at the existing case record to see what work has been accomplished, determine what needs to be done to finish the case, and prepare new forms if a mistake has been made that must be corrected. Sometimes the court has accepted a document that is incorrect, and a Quality Control/Judgment Clerk catches the error and sends the Judgment back for correction. We can fix any mistakes and get new forms submitted, along with any forms that have not been done yet.